Cafe Luwak in Depot Town has always been a mix of one part deli, one part ice-cream store and one part coffee shop. Now they can add one part diner since they recently expanded their menu to include traditional grill options such as burgers and chicken sandwiches; they also changed to sit down ordering. Before the switch dine-in customers put their order in at the counter then grabbed a table and the food was brought out. The core of their previous menu was deli style sandwiches and there are still plenty to choose from, with a couple of new additions. 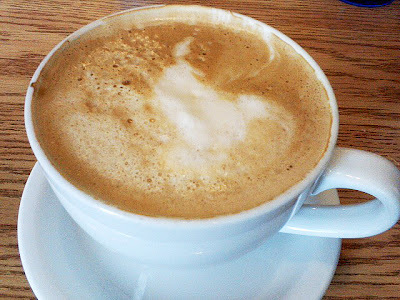 Until this last weekend we hadn’t been to Cafe Luwak in several months. The last couple of times we were in they still only had the counter service. We found it often slow to get food; it sometimes took as much as half an hour to get two sandwiches for carryout. With the new change to dine-in service I was interested to see if things had improved. We decided to give Cafe Luwak another try for breakfast this last weekend. They have expanded their breakfast menu offerings and even offer a breakfast buffet on the weekends. We skipped the buffet this time and opted to order individual breakfast items off the menu. They now offer a number of egg dishes and griddle items including buttermilk pancakes, Belgian waffles and French toast. Nothing fancy, but all your expected morning plates. When we walked in at 9:30 on a Saturday morning the sign said ‘Seat Yourself’ so we chose a table in the back. After waiting about 5 minutes for a waitress to come by were were starting to wonder if we should have ignored the sign and asked to be seated instead. Another minute passed and a waitress did finally greet us in a friendly manner apologizing for the delay, but they were short handed. She took my order for a caramel latte and gave us a few minutes to decide on the menu. I ordered French toast with a side hash browns and locally made Detroit sausage. The caramel latte was delicious and it’s a nice change to have it served in a ceramic mug instead of a typical paper to-go cup. Their is something especially comforting about putting your hands around a real coffee cup and sipping from its lip which you don’t get with carryout coffee. The highlight of my food order was definitely the locally made sausage. The freshness and quality were evident and the taste was a nice balance of light sweetness and a slight complexity from the seasonings and herbs. 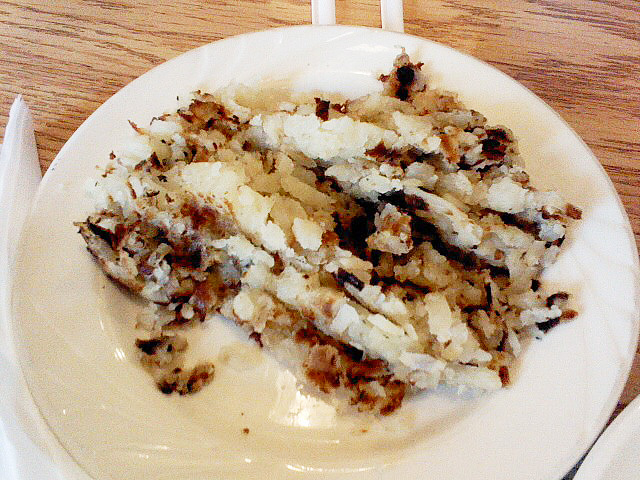 The hash browns were a bit soft, only crispy on the top and were a bit bland. 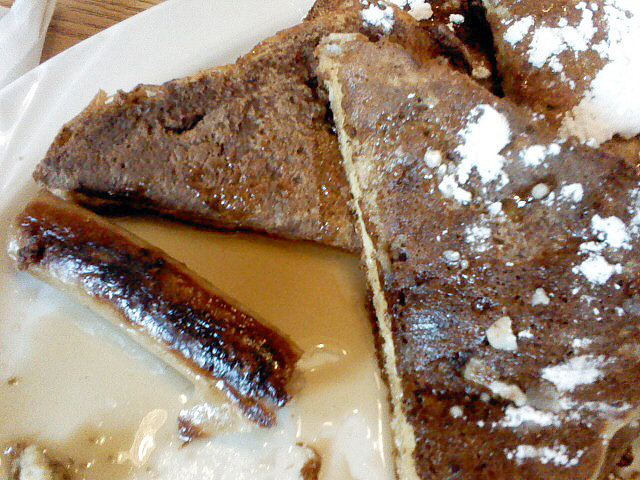 The French toast portion was huge with three full slices of challah bread sliced in half. The syrup pitcher on our table was broken and we had to ask for another along with powdered sugar. It was good French toast overall, not anything special, but it wasn’t greasy and the challah bread was the right blend of thick and soft. When we finished our meals we had to wait a while again for our check. It seemed that only one waitress was serving that morning. Apparently, if one person calls in at Cafe Luwak they run into trouble, but she was doing the best she could. At least she was friendly despite her tired appearance. I like the new menu choices, traditional additions, but they broaden the customer options beyond the deli sandwiches when they’re looking for a change. It also brings another breakfast spot to the Ypsilanti area. The service doesn’t seem to have improved much, but if you’re not in a huge hurry it might be a nice change from your usual place. Make sure to get a side of the local sausage. They also serve locally made bacon, which I’ll have to try on another visit.